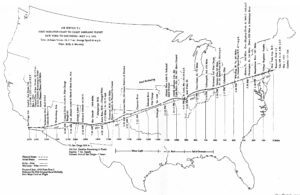 The first trans-continental flight across America was made in 1911, just 8 years after the Wright’s historic 59 second, 852 foot distance flown over the sands at Kitty Hawk January 17, 1903. But it took Calbraith “Cal” Perry Rodgers who took off from Sheepshead Bay, New York on September 17, 1911, a total of 49 days to reach Long Beach, Pasadena, California on November 5, 1911. His Wright EX biplane was named “Win Fiz”. It was powered with a Wright 4-cylinder water cooled engine of 35 horsepower, driving two pusher propellers. The Hearst newspapers, at the time, had offered a $50,000 prize for the first coast-to-coast flight completed within 30 days. “Cal” Rodgers was sponsored by the Armour Company of Chicago who were interested in marketing their Win Fiz soft drink by advertising on ‘Cal’s” aircraft as it progressed across America. They even furnished him with a special train to carry spare parts, mechanics, an automobile, and other personnel, including “Cal’s” wife, to follow the aircraft across the country. 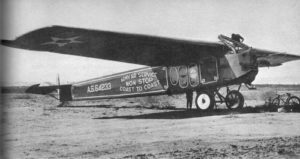 Along the way he suffered a multitude of mishaps and very few original parts of the aircraft remained at the completion of the trans-continental flight. Unfortunately “Cal” did not receive the $50,000 prize as his flight was not completed within the 30 day period stipulated in the rules. 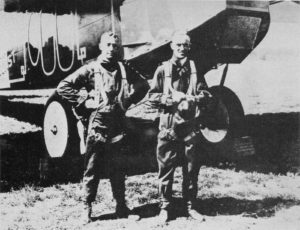 It was not until 1923 when Lieutenants Oakley G. Kelly and John A. Macready were finally successful in flying non-stop across the United States. And it took three attempts before they succeeded. The following article by R. L. Moore titled “If at First You Don’t Succeed…THE FIRST NONSTOP COAST-TO-COAST FLIGHT” appeared in the November 1974 issue of The AOPA Pilot. It clearly illustrates the obstacles Kelly and Macready had to overcome to successfully complete their Outstanding Flight across the continent. The first aircraft to fly non-stop across America. Today it resides in the National Air and Space Museum, Washington, D. C.
Today 747s swoop from New York to San Diego in 4 1/2 hours. But 51 years ago, when Lieutenants John A. Macready and Oakley G. Kelly made America’s first nonstop transcontinental flight, it took a bit longer. The trip took 26 hours, 50 minutes, and 38 seconds to be exact – a remarkable feat, considering that the aircraft piloted by Macready and Kelly averaged only 92 mph, and that a compass and assorted highway maps were the pilots’ only navigational aids. Kelly was a five-year veteran in the Army Air Service when he first got the urge, in 1922, to attempt the cross-country flight. Earlier that same year, Lt. James H. Doolittle had broken all records for cross-country flight when he flew from Jacksonville, Fla., to San Diego, Calif., in his de Havilland, stopping en route for fuel. And Lt. Col. R. L. Hartz and Lt. E. E. Harman had made a circuit flight around the boundaries of the United States in a Martin bomber, over a distance covering more than 9,800 miles. But no one had crossed the nation nonstop. In the early twenties, the Air Service was hard pressed to justify the maintenance of its 1,681 airplanes and 958 officers. Many people felt that, since the war was over, flying was useless. Eager to prove its worth, the Air Service was glad to have the publicity brought by a record-breaking demonstration. So when Kelly presented the idea of the nonstop crossing, the War Department approved it in a snap. The problem lay in finding an aircraft with enough range to make the trip. 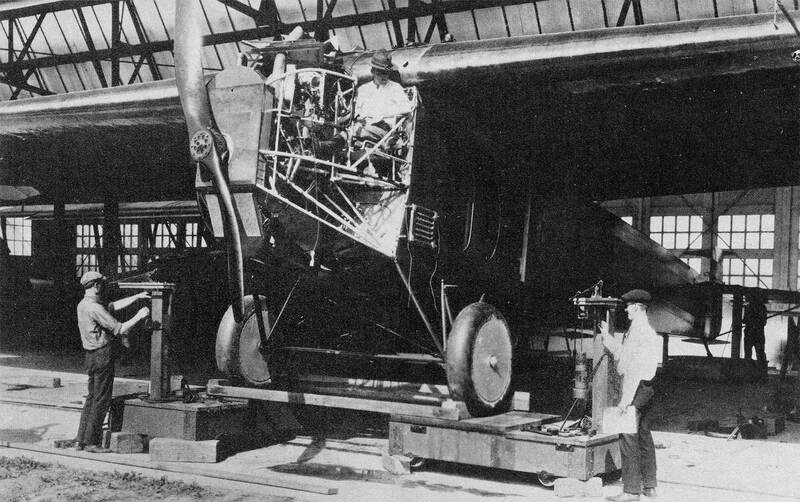 The Fokker F-IV (T-2) as originally built in Verin, Netherlands. Cabin was modified from the 10-place configuration, double wheels were replaced by Martin bomber wheels and the engine replaced by the American-made Liberty V-12. Pilot sat alongside the engine. 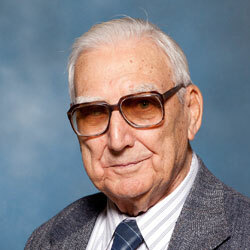 Smithsonian Institute photo. Kelly finally selected the Fokker F-IV, a high-wing monoplane designed by the Dutch weaponry wizard who had given the Germans such advanced aircraft during World War I. The F-IV was one of the few new transports General Billy Mitchell had been able to acquire in the postwar period. 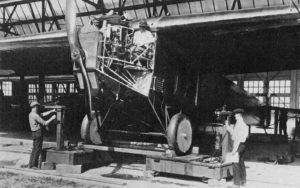 It was decided to call the aircraft “T-2” (standing for “Transport 2”) since mention of the name “Fokker” was likely to rankle a public still recuperating from the war. The single-engine T-2 was a huge aircraft for the time, with a wingspan of 79.57 feet. The blunt-nosed aircraft had fully cantilevered wings and boasted a Liberty engine in command of a two-bladed wooden prop. Kelly figured that, with some modifications, the T-2 could handle the job. But the venture would require a second flier. He initially planned for Lt. Muir S. Fairchild to be on board, but when Fairchild was injured in an aircraft crackup, Kelly asked Lt. John A Macready to fill in. Macready was a good choice as co-pilot. A five-year Air Service veteran himself, he had already set a world altitude record and had also test-flown the 42,000-pound Barling bomber, largest plane built in its day. He was eager to be part of the transcontinental attempt. The huge T-2 transport balances on three scales for a preflight weigh-in. U. S. Air Force photo. 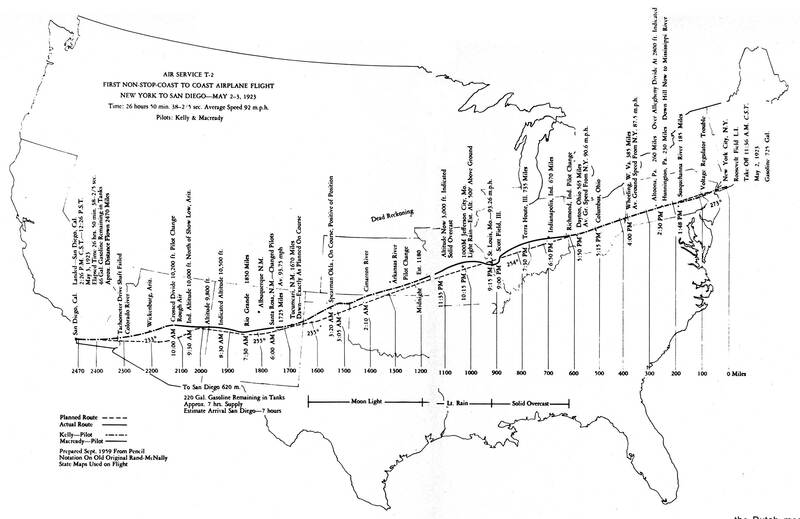 Kelly and Macready had originally planned to fly from San Diego eastward, to take advantage of the prevailing winds. This would present the problem, however, of topping the California mountains early in the flight, when the T-2 would still be heavily loaded with fuel. The pilots had hoped to solve that problem by flying northward after leaving San Diego, then dropping back down at San Jacinto, where the mountains were lowest, to reach the border area of Yuma, Ariz. The circuitous route would add an extra 300 miles to the trip, but the added distance would be preferable to bucking headwinds on an east-to-west flight. In September 1922, Kelly and Macready arrived with their T-2 at Rockwell Field, San Diego. The pilots hoped, as Macready put it, to “take a few sun-baths on the beach at Coronado and a number of swims in the Pacific” before undergoing the ordeal of the flight.” But such relaxation was out of the question. Stacked beside the T-2 are gas and oil containers holding the necessary fuel for their record flight. Kelly (center) is shaking hands with the plane’s chief mechanic, Clyde Reitz; Macready is at right. U. S. Air Force photo. On October 4 the pilots learned from the U.S. Weather Bureau that a full moon was expected for the next night, to be followed by daytime clear sky and a moderate westerly wind. Conditions seemed perfect; the fliers would depart at sunrise. They arrived at Rockwell Field shortly before the sun appeared, neither pilot having slept much the night before. A flip of the coin had Kelly as the pilot on takeoff. Macready climbed into the cabin seat. With a total load of 10,695 pounds, the T-2 was weighted almost to maximum. Lts. J. A. Macready, left, and Oakley G. Kelly, with the T-2. Because detailed aeronautical charts did not exist in those days, Rand & McNally road maps had to be used. Smithsonian Institution photo. On the first try the T-2 wouldn’t budge. It was as though the chocks were still in place. Macready had begun to wonder whether he had “come all the way across the continent to give a burlesque show on a steam roller” when the T-2 began to inch down the strip. A mile down the runway, the heavy plane began to lift. Gaining altitude was slow, and when Kelly went into a turn to avoid hitting Point Loma, the craft dipped dangerously close to the ocean. Kelly circled North Island twice and got the plane up 200 feet. At Temecula Pass, 50 miles from San Diego, the mountains were soupy with fog. By now the T-2 had reached an altitude of 1,700 feet. For an hour the two pilots searched for slots in the foothills, but the fog soon grew so thick that they could not see more than 50 feet ahead. Cruising blind through those winding mountain passes was bound to result in a crackup. Even if the fog completely dissipated, the fliers had used up so much of their fuel allotment that the cross-country attempt was defeated. Kelly and Macready knew they would have to turn back, but it seemed a shame to waste all those man-hours they had spent on preparing the T-2, so they decided to shoot for a world endurance record. The T-2 was modified from the Dutch-made F-IV. Its wing was scaled up from the WW1 Fokker D-8. Smithsonian Institute photo. Back over Rockwell Field, the pilots circled at low altitude and dropped this note, addressed to Capt. R. G. Ervin, commanding officer: “Impossible to get through mountain passes with heavy load on account of dense fog… We are attempting to break the world’s endurance record for airplanes… Please get in touch with… National Aeronautical Association… to authenticate our endurance record should we be successful…” Hovering over San Diego’s country-side, the pilots changed shifts every six hours. The first night was cold. The pilot at the main controls was exposed to the torture of chilly winds slapping him at 100 mph; cramped arms and legs; and the deafening roar of the propeller, which made note passing the only effective means of communication. At the end of a six-hour shift, the main pilot would crawl through a tunnel-like passageway to the rear controls. Dual controls enabled the pilot in the rear to level the ship while the pilot up front burrowed his way back. When the T-2 finally touched down at 5: 11 p.m. on October 6, the bone-weary Kelly and Macready had managed to endure 35 hours, 18 minutes, and 30 seconds in the air. The National Aeronautic Association, however, could not declare the record official because a sealed barograph had not been aboard the airplane. Kelly and Macready were eager to make their second attempt at a transcontinental flight. They ordered their mechanics to overhaul the T-2 and hoped to start again in two or three days, if weather conditions permitted. Finally, on November 2, 1922, the air-men got the word they had been waiting for from the Washington Weather Bureau. The following morning the pilots were at Rockwell Field before dawn. They had slept only three hours the night before. When fueled, the T-2 weighed 155 pounds more than it had on the first attempt. The aircraft again lifted slowly on takeoff, but this time the air was clear, and Temecula Pass and the San Jacinto Mountains presented no problems. The team dropped down to the Salton Sea, as they had planned, and crossed east to the Colorado River. At Tucson, Ariz., the high mountains forced the T-2 to its maximum ceiling. Updrafts lifted the plane with extra 100- to 300-foot boosts, then let it drop suddenly. Around Deming, N.M., a southerly wind knocked the aircraft around a bit. It took a strong effort just to keep the plane 50 feet above the jagged peaks. The T-2 crossed Deming at 5,200 feet, but Kelly, who was at the controls again, knew that the course ahead lay over elevations of 7,000 feet. Down currents of air around Tecolote, N.M., plunged the aircraft groundward. Barely skimming cactuses and bushes at 20 feet, the T-2 grazed a mound of earth that sent its wheels spinning. The mountains at Tecolote were insurmountable because of the weight the aircraft carried; therefore, the pilots jockeyed the plane around for 40 minutes to consume enough fuel to lighten it. Finally the balky aircraft cleared the summit with less than 30 feet to spare. As night advanced without the moon appearing, the pilots’ course was an aimless one until they caught a twinkle from the lights of Tucumcari, N.M. Here Macready took over. Rain lessened the visibility even more, forcing Macready to fly just over the treetops to miss the clouds. Lightning occasionally brightened the landscape, revealing train tracks to guide the fliers. Goggles ablur, hearts in their throats, Kelly and Macready were actually on the edge of a storm system which, they later learned, killed 12 persons and injured 80 in Oklahoma and Kansas. At Pratt, Kan., Macready left the railroad and aimed straight by compass for Wichita. It was after midnight, and for stretches of 30 or 40 miles no lights of any kind appeared to guide the fliers. When the welcome lights of Saint Louis appeared, Kelly assumed control. But Macready’s elation was premature. Shortly past Terre Haute, Ind., the T-2 started rocking erratically. The Liberty engine’s water jacket had cracked, and water in rivulets squirted from both sides of the engine. The pilots changed shifts again in Dayton, Ohio, while the leak grew more serious. Shortly after the T-2 passed Indianapolis, the engine grew so hot that Macready prepared for a forced landing. It didn’t seem that the Liberty could last another five minutes. Macready prayed that the plane would make it back to the Indianapolis Speedway, but it didn’t seem likely. Then Kelly had a bright idea. He began pouring all the liquids from the food supply – beef broth and coffee – into the radiator. 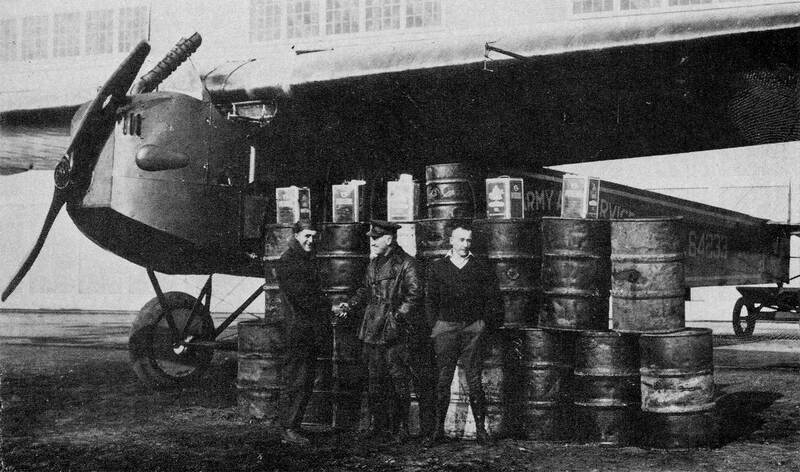 With these coolants, the fliers were able to reach the Indianapolis Speedway and land safely. Thus the second attempt to cross the country nonstop was curtailed. Macready and Kelly had had it – some other fools could attempt the flight. But after two days of rest, Kelly was back at the map, rerouting a new flight. Soon Macready, too, was bent on trying again. From the U.S. Weather Bureau, the pilots learned that during the latter part of April an unusual pressure condition occurred in the United States, reversing the prevailing winds from west to east. While this temporary condition –­ known as the “Hudson Bay High” ­– obtained, an aircraft could make the transcontinental flight from east to west with the winds in its favor. This would be ideal for the fliers because by the time they would reach western mountains, the aircraft would have burned off enough fuel to be able to attain higher altitudes. But April was a long way off, and Kelly and Macready were eager to make the Air Service proud of them. Since the duration record they had set at San Diego had not been officially accepted, they decided to establish a better one officially. Two Frenchmen had recently set a record of 34 hours in the air, but Kelly and Macready planned to beat that time. Their first attempt was made at McCook Field in Dayton, as newsreel cameras and hopeful crowds looked on. The T-2 taxied out on the field, rolled about 50 feet, and then bogged down solid in the mud. Embarrassed but undaunted, the duo made a second attempt on March 30, 1923, but preignition problems developed in the Liberty engine, and after only eight hours Macready had to bring the T-2 down with a dead engine in the midst of a snowstorm. 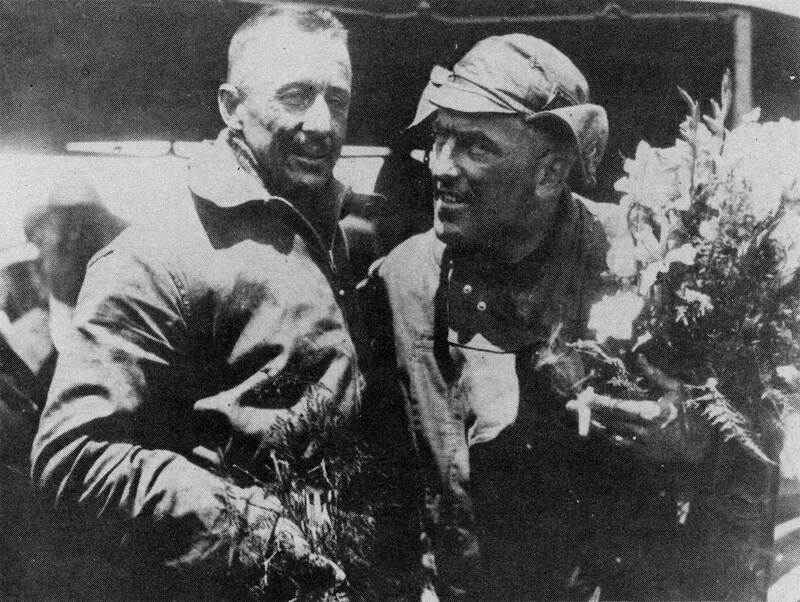 The pair’s final attempt at the record was made on April 17, 1923. Kelly and Macready set a new endurance mark of 36 hours, 14 minutes, 8 seconds, with Orville Wright acting as official time-keeper. In preparation for the long-awaited third transcontinental try, the pilots had the T-2’s engine replaced and went on to Long Island, N.Y., which was to be the flight’s jumpoff point. Fuel from California was shipped in, engineering tests having revealed that this fuel was superior to eastern fuel in its antiknock quality. On May 2, 1923, the T-2 was loaded to 10,850 pounds, just 150 pounds shy of its maximum gross weight limit. With Kelly again at the controls on takeoff, the aircraft rolled a mile down the runway of Long Island’s Roosevelt Field, but refused to lift. There seemed to be only one way to get the plane into the air. Kelly taxied to a plateau that afforded a 20-foot drop over neighboring Hazelhurst Field. When the T-2 shot over the edge of the precipice, at least it was up. A row of hangars loomed ahead. Excitement rose in the watchful crowd be? low: Could the T-2 clear the hangars? An Army colonel in the crowd bet $5,000 that it could, and that the T-2 would next be seen in San Diego. The aircraft skimmed over the hangars and crossed New Jersey at 400 feet. Over Pennsylvania, Kelly shook the controls to signal Macready to take over from the rear. The rear controls were for temporary use only, and visibility was poor from the rear cabin, so Macready grew slightly miffed when almost a half hour had passed and Kelly had not taken back the controls. Macready then learned that Kelly, having noticed a malfunction in the voltage regulator, had completely disassembled the unit in his lap and adjusted the breaker points. This bit of mechanics was delicate enough when performed in the repair shop, let alone in the open air at speeds close to 100 mph. But if Kelly had not been successful, the batteries would have discharged, leaving the T-2 with a total loss of electrical power. The fliers crossed the Allegheny Divide at 2,800 feet and navigated across Pennsylvania, whose winding railways, rivers, and roads constantly confused their sense of direction. When they reached Dayton, Ohio, at 5:50 p.m., Macready became the main pilot. Mist began to impair the visibility, but Macready could occasionally see the headlights of an automobile below. After the T-2 crossed over the Wabash River, however, the drizzle obscured any headlights. Just before 9 p.m., Macready suddenly saw a shaft of light in the distance. It was the 450-candlepower searchlight at Scotts Field, Ill., providing a guidepoint from which the pilots could find Saint Louis. Before long the pilots were just south of Jefferson City, Mo., which was a blur in the mist. They crossed the Missouri-Kansas line at midnight. The moon emerged when the plane was near the Arkansas River, and Kelly once again resumed control. Dawn broke as the pilots flew over Tucumcari, N.M. At Santa Rosa, N.M., 1,725 miles into the flight, Macready took back the controls. In the vicinity of St. Johns, Ariz., the countryside began rising faster than the T-2 could climb. The plane was still too heavy with fuel to surmount the heights with ease. In addition, the elevation charts were inaccurate, and while the contour map showed ground elevation as 8,000 feet, the T-2’s altimeter was actually registering 10,200. Further difficulties were presented by a strong crosswind that had replaced the Hudson Bay High and was thwarting the plane’s efforts to gain altitude. All of these conditions combined to force Macready to divert from the planned course and strike out in a westerly direction. Eventually the fliers picked up the Santa Fe Railroad near Wickenburg, Ariz. Near the Arizona-California border, the T-2’s tachometer drive shaft failed, but no matter – Macready was headed for the Pacific Ocean with only 170 more miles to go! At San Diego’s Rockwell Field, May 3, 1923, tired fliers Macready (right) and Kelley were welcomed with bouquets on completion of their historic transcontinental flight. Soon San Diego was in view. Macready banked the T-2 and passed squarely along the city’s main street, clearing the buildings with 100 feet to spare. Cheering crowds, waving handkerchiefs and sheets, lined the rooftops. Macready took one turn around North Island, in order to head into the wind, and expertly landed at Rockwell Field. Grinning, the pilots hopped out of their plane as the stopwatch froze their elapsed time. They were greeted by Major H. H. “Hap ” Arnold, later to become chief of the U.S. Army Air Forces. Telegrams arrived from President Harding and General Pershing, congratulating Kelly and Macready on their triumph. Among the messages was a $5,000 check for the two fliers from Col. Frank R. Kenny, former executive officer of the Air Service, who had won his bet at Roosevelt Field.